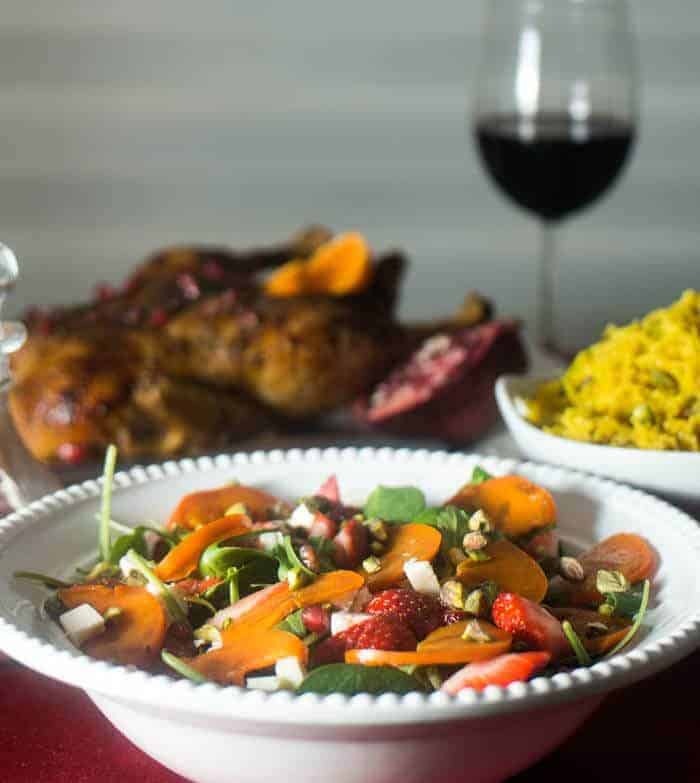 Spinach and Persimmon Salad with Citrus Dressing combines a sweet fuyu persimmon and strawberries with salty feta cheese and pistachios in a spinach salad lightly dressed with a citrus marmalade-based dressing. ~~ Dr. Seuss, How the Grinch Stole Christmas! Christmas is but a few days away… Our Christmas ducks are beginning to thaw, the saffron, pomegranate molasses, za’atar, etc. survived the miles at 35,000 feet between Harlingen and Charlotte, and I’m ready with a recipe to complete my lovely Persian-inspired menu! 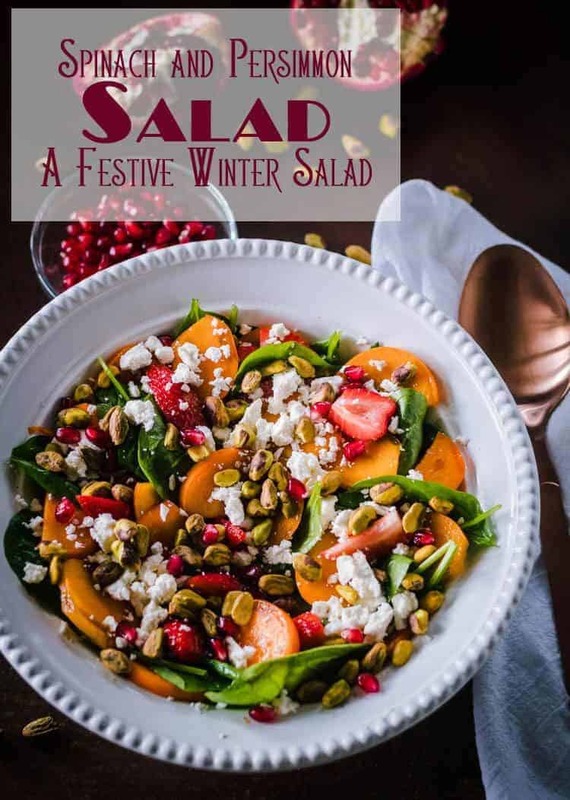 Spinach and Persimmon Salad with Citrus Vinaigrette combines sweet persimmons and strawberries with salty feta cheese and pistachios in a spinach salad lightly dressed with a citrus marmalade-based dressing. The flavors complement my Za’atar and Pomegranate Molasses Roasted Duck and Zereshk and Pistachio Pilaf beautifully. This menu is elegant, a bit exotic, healthy, and surprisingly simple to put together. This luscious and colorful salad is my variation of My Food Story’s Greens, Persimmon Ricotta Salad with Orange Dressing. When Richa posted the recipe on Facebook, I knew I had to give it a try. Earlier that same week, I’d seen beautiful persimmons in my local HEB market. McAllen, Texas (with its sub-tropical climate) has an amazing variety of fresh produce year ’round. The strawberries were gorgeous. I opted to use feta in place of the ricotta, and pistachios in place of the pecans or walnuts. I typically approach salad-making in this fashion. I look at the overall composition of the menu, the other ingredients, and customize my salad to complement the main dish and other side dishes. Feta and pistachios just “fit” with the other flavors in this menu. The optional pomegranate arils are a perfect addition, and provide an additional pop of color that is so appealing. 🙂 Pomegranates are a bit of work to break down, and can be difficult to find (even in winter), which is why the arils are listed “optional.” I also used them to garnish the duck. I have occasionally seen pomegranate arils in vacuum sealed bags in supermarkets. They are something of a key ingredient in Persian cuisine, and if you’ve not tried them, you ought to. The next few days will find me either in the kitchen or chasing a very busy toddler. Being a grandparent is a gift, and I plan to enjoy every minute I can with little Cade. I will get back to the blog when I return to McAllen this weekend! Blessings to you this Christmas, and a very Happy New Year! Combine salad dressing ingredients in a blender. Pulse until smooth and emulsified. In a salad bowl, combine spinach, strawberries, and persimmon slices. Sprinkle with pistachios, feta, and pomegranate arils (if using). Drizzle with salad dressing and toss just before serving. Use a good quality light vinegar - champagne, rice, white wine, citrus vinegars are good substitutes for the white vermouth vinegar. Bitter orange marmalade is the perfect counterpoint to the sweet fruit in this salad, but you can substitute any marmalade. I very lightly dress salads. If you want to serve the dressing separately, or want the salad more heavily dressed, scale up the recipe accordingly. Use your favorite greens. I like spinach, but I have also used a baby greens blend that was really nice. My market had beautiful hachiya persimmons. They are an astringent variety, and must be ripe, or they will leave a very unpleasant sensation in your mouth. When ripe, they are very sweet and delicious. This recipe calls for fuyu persimmons. Macronutrients (approximation from MyFitnessPal.com): 297 calories; 4 g protein; 44 g carbohydrates; 14 g fat. Beautiful salad! love the sound of marmalade in the dressing too - very interesting! Thanks Jayne! It adds just the right sweetness to the vinaigrette... I've used all kinds of preserves in my salad dressings, and look forward to having a salad dressing Ebook out soon! I love persimmons!! This salad is being added into my lunch rotation. That dressing sounds fantastic. I love to make salad dressings... They're so much healthier than commercially prepared ones. :-) Thanks Renee! One of my dear friends keeps urging me to try persimmons and I yet to do so. You've got me convinced I need to do this very soon. Love the dressing you've come up with as well. I really hope you try them KC... They're a nice addition to a salad for sure :-) Thanks! Such a beautiful salad! I don't have too much experience with Persian cuisines, but it sounds lovely! Thanks Sarah! You should take a closer looks at Persian cuisine. Many of the dishes are quite simple to make, and the ingredients are so flavorful. What a bright colorful salad! Sounds like what I need after several weeks of comfort food style indulgence!